The world has been perfect for many years. When the Cloud became self-aware and turned into the Thunderhead, it was able to see solutions for all the problems in the world. Now there is no hunger, poverty, disease, or natural death. 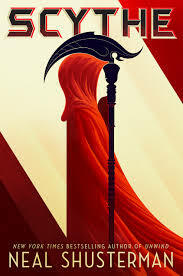 In order to combat the threat of overpopulation the Scythes were created. Scythes are people tasked with "gleaning"- the only way actually die in this society. Neither Citra nor Rowan want the job when they are chosen to be apprentices to Scythe Faraday but they both begin to see the value of the job when it is done well and with compassion. However, not every Scythe sees the job in the same way with some embracing the killing and looking to get rid of the old guard. At the spring conclave of Scythes, one of these others sees an opening and sets in motion a plan to turn Citra and Rowan against each other. I have read all or nearly all of Shusterman's books and in my opinion they vary in quality of writing and storytelling. When he gets it right, however, he blows me away and Scythe is one of those stories. It is the kind of book where I was on edge the whole time because I loved it so much that I was worried it would end in some disappointing way that would ruin it for me. But instead, the story kept developing in unanticipated ways. And not only is it a good story, but it is also has some scary parallels to real life situations with abuses of power and people who believe they are above the law.